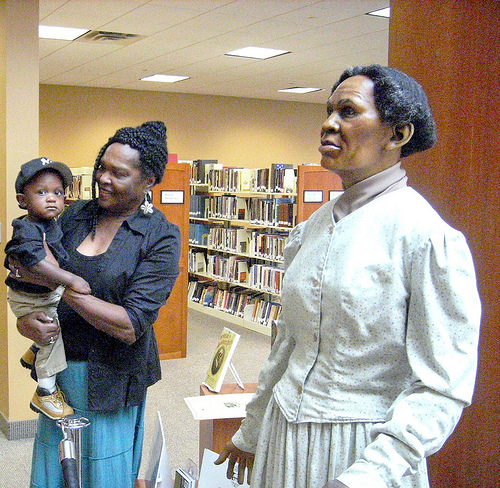 Sojourner Truth wax figure on display in the Truth Room at the Oxon Hill Branch. Image courtesy the Prince George's County Memorial Library System. Please join us the Lakeland Community Heritage Project at the Oxon Hill Branch Library this Saturday November 21 at 2:30 PM for “Preserving Lakeland’s Heritage: A History Book For Everyone” a presentation by the authors of Lakeland: African-Americans in College Park. This event is graciously sponsored by the Prince George’s County Truth Branch of the Association for the Study of African American Life and History and the Sojourner Truth African American Research Collection. The presentation on Lakeland will include photos from the book and excerpts from oral histories. The Oxon Hill Branch Library was built in 1966-67 on the site of the Sojourner Truth Elementary School, a black school that educated educated African-American children from several communities in southern Prince George’s County from the 1940s its close in the mid-1960’s. In addition to the incredible Sojourner Truth African American Research Collection–itself named for the school–the Oxon Hill library features six painted glass panels, entitled “However far the stream flows, it never forgets its source” [Yoruba Proverb] by Nancy Gutkin O’Neil. Installed in 2006, this artwork is designed to “whet the appetite” of library visitors to explore the shelves, resources, and programming at Oxon Hill Branch Library. If you would like to make a day trip out of the event, you could even include a visit to the historic 1928 Oxon Hill Manor.